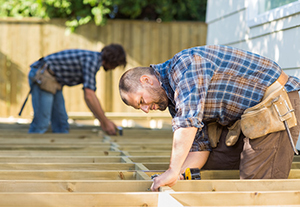 Being a carpenter is one of the most dangerous building and construction trades due to varying work environments and exposure to many other trades and disciplines that carpenters are required to coordinate from a Work Health and Safety perspective. Executive Officer – Safety, of Master Builders NSW, David Solomon informed Pro Choice Safety Gear that often, the natural progression for a carpenter who displays excellent supervisory and organisational skills is to become a leading hand, supervisor and foreman or site manager. “Usually as a chippie, their contract covers more trades than carpentry work, such as organising concrete placement, formwork, framing, cladding, joinery and site setup to name a few,” Solomon said, adding that carpenters often deal with many sub-contractor related questions. Resultantly, he said carpenters will regularly face all the dangers found in building and construction trades, such as those posed by power tools, machinery, chemicals, UV radiation and heat stress. However Solomon said that of the many dangers chippies face, working at heights is the most common and the most serious. “Chippies should receive adequate working at heights training, use fall arrest systems and hold the knowledge to recognise the hazards and risks that require attention”. He said that training is critical across all facets of the job and that the appropriate Personal Protective Equipment (PPE) must be provided to workers, including – but not limited to – safety boots, gloves, goggles, ear protection and high-vis clothing all specific to the application. Solomon stressed that any PPE must be suitable for the work and associated hazards. It must fit, be comfortable, well-maintained, hygienic and in good working order. Workers must use the PPE “so far as is reasonably practicable” and Employers must also provide information and training on its correct storage and use. Another critical safety consideration for carpenters is reliable and proven communications for situations such as working in confined spaces, communicating between the tower crane driver and dogman, working in remote areas or for communication on larger sites, according to Solomon. For managing heat stress, he recommends scheduling work for cooler periods of the day such as early morning or late afternoon. Where this is not possible, he said workers should have access to plain drinking water and consume at least 200mL every 15-20 minutes, while avoiding energy drinks (which have been banned on some sites) and caffeinated drinks which can have a diuretic affect. Realistic workloads, shaded rest areas, frequent breaks and worker monitoring should also be in place and UV protection also offered. “Workers should be provided clothing with a UPF 50+ rating such as loose shirts with long sleeves and collars as well as long pants. Broad spectrum sunscreen, broad brimmed hats and sunglasses which meet Australian Standards for UV protection can also be worn,” Solomon said. For those who wish to learn more, Master Builders New South Wales offers their Supersafe course, a two-day Building and Construction Industry-specific WHS training course targeted at construction site supervisors, developed in conjunction with the Construction Safety Alliance (CSA) and SafeWork NSW. Great article with some really good information I can pass onto my team. Welding at height? A LINQ Hot Works Harness might save your life.